Wendy takes great pride in the personal attention she gives to her students and families, and the results speak for themselves. “I want to extend our gratitude for the remarkable work you did with our daughter. From the earliest meeting, you listened intently to our collective thoughts about what was most important to us, and you honored and respected our desires throughout the entire application process. On an individual level, you effectively elicited our daughter’s personal values and interests and guided her accordingly. You learned about her not just as a student, but also as a whole person. Your guidance, oversight, and wise advice completely took the pressure off of us, which we greatly appreciate. We felt complete trust in you, and would be happy to recommend your services highly to those who may inquire." "Over the course of the long, arduous process, Wendy's expertise, insight and wise counsel proved priceless in helping our son identify the schools where he would have a best fit, develop a strategy for applying to those schools, and ultimately deciding which school he would attend. I don't know how we could have survived the process without her." "Wendy is outstanding at every part of the college admissions advising process. She quickly and accurately figured out where our daughter was coming from, efficiently guided her to the right group of target schools, clearly established a sequence and schedule for completing applications and effectively edited her essays. At each step of the way, her understanding of the universities (and their admissions offices) made a big difference. Moreover, when we, as parents, needed advice about the process and how to play our role properly, Wendy was fantastic, both on the phone and by email." "I cannot recommend Wendy highly enough! We hired her to help our third child through the college application process. While I expected Wendy to bring her usual attention to details and valuable insight to the table, I did not count on her connecting so well to my high school kid. My child happily met every deadline Wendy imposed and, as a result, I can honestly say that I did not have a single moment of stress regarding the entire process. The gravy was that our daughter got in to her top choice school in December. I could not have asked for anything more." "Our daughter's college search was unfocused and we felt we were running in circles. After just two meetings, Wendy had a clear list with realistic choices and had researched all the areas that mattered to us. She worked with our daughter on essays and applications and resumes and deadlines and allowed us to be supportive and loving parents. Our daughter was accepted to her first choice and we are all so proud of her. We will certainly work with Wendy again for our next child. Remove the stress - go to Wendy - she's thoughtful, detail oriented, focused and cares about her students." "Our son loved working with Wendy, and I cannot imagine anyone serving him and his future better than she did. The benefits of working with Wendy (which she was able to deliver even though we live 200 miles from Chicago) were a better process and outcome for our son, and less stress and conflict for our family. 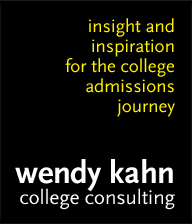 Wendy shared her deep knowledge of the colleges and experience with the admissions process to wisely guide our son through each step, enabling him to reach his own conclusions and decisions. She invested the time and attention to get to know him well, she helped him organize and held him accountable (so that we did not have to) for his tasks, and she was always available to calmly and wisely address concerns when he—or we—panicked. Most significantly, while our son gained admission to nearly all of the schools on his well-crafted list, including schools more selective than the one at which he chose to enroll, with Wendy it was always more about finding the best fit than merely getting in." "Wendy helped my niece achieve her college dream from more than 500 miles away! Working via Skype and email, Wendy got to know our student well and created a not-too-long college list focusing on schools that were a good fit culturally, academically, and -- most important for us -- financially. Our investment in Wendy's insight and wisdom was returned many times over in scholarships and grants obtained -- my niece was accepted at 6 of the 7 schools where she applied, and awarded significant merit scholarships and financial aid at all 6 of those schools. With Wendy's guidance, our student achieved her dream of being able to attend a great college where she will thrive and be challenged. And our family met all the deadlines and requirements with a minimum of angst, thanks to Wendy's organizational skills, patience, persistence, and kindness. Thank you, Wendy!" "Before our family began working with Wendy, we had many unanswered questions about the college application process. Because we knew our questions were not unique and didn’t want to reinvent the wheel ourselves, we hired Wendy. Only when our son started working with her did we realize how little we knew about what colleges look for in an application and how to map out the process. Wendy's methodical step-by-step approach -- personalized for our son -- brought discipline and order to what can be an emotional, stressful, yet exciting time. Realizing that she really has "two clients" -- the student and the parents -- Wendy managed both well, taking us out of the day-to-day and giving our son ownership of the process. Our role was limited but important, and our son was grateful to us for letting him handle the process on his own with Wendy. It takes a lot of trust to share the management of a child's college application effort. Wendy earned that trust every step of the way." "From the beginning when I had no idea where I wanted to apply, let alone how to apply, you were with me every step of the way to give me advice and direction. Whenever a bump in the applications came up you helped solve it with your regular magic. When I was at the breaking point, ready to just crawl into my bed for a week, you talked me down and helped me figure out my plan. I wouldn't have had a chance of getting into any of those schools if you didn't help me. I can't thank you enough for all you've done for me."